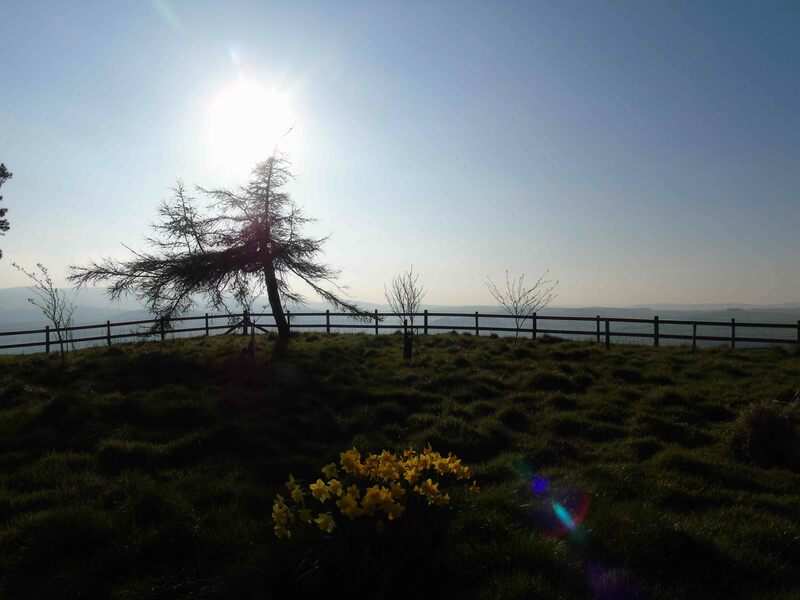 Take a short diversion off the Offa’s Dyke path to the south of Knighton, one can encounter the beauty of Hawthorn Hill. In a previous post I’ve discussed the adjusted-segmented arrangement of the dyke as it navigates the western edge of this hill. 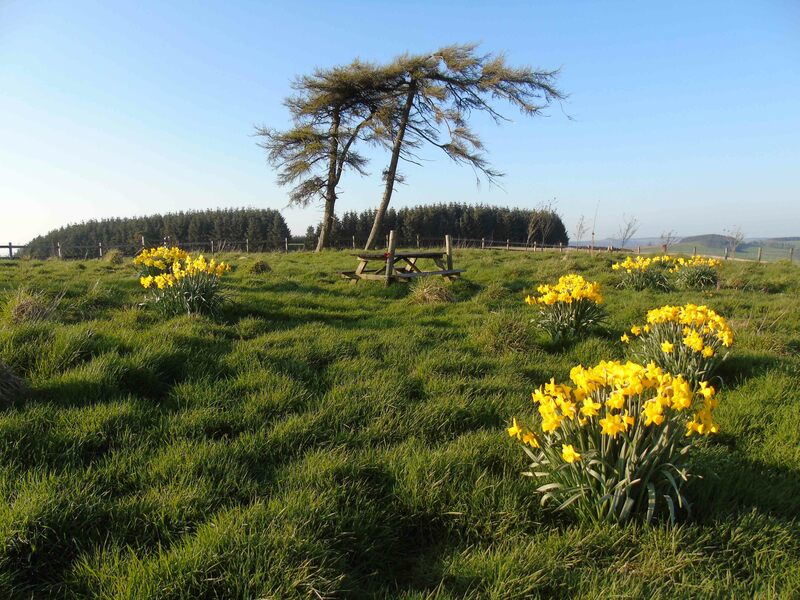 Many of those exploring the hill might stick to the dyke and miss out on a very special place just adjacent to it. I don’t know of any archaeological traces from the hilltop, but when I visited this spring, I was wondering over the difference in viewsheds from the dyke itself and from the hilltop it circumvents. Walking up to the hill does not prepare you for the experience: the views are staggering and contrast markedly to the west-facing perspective from the dyke itself. 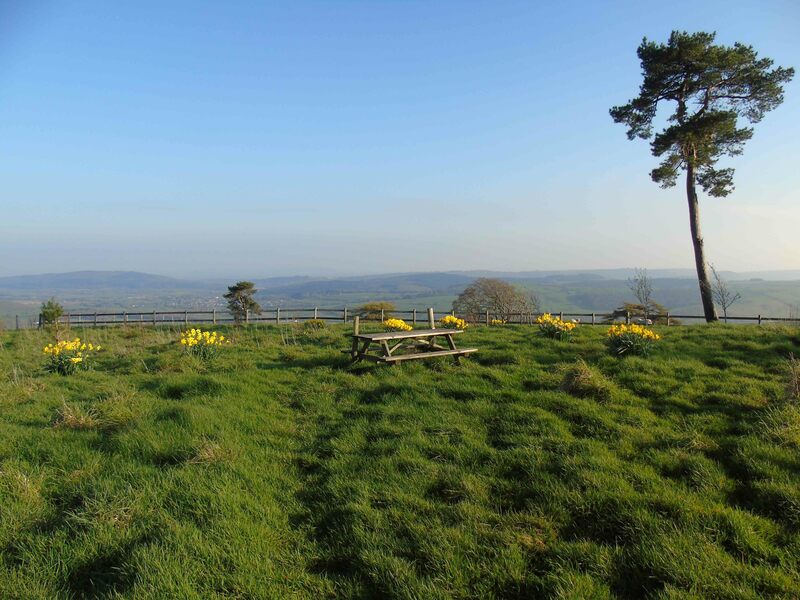 The hill affords views over the landscape west towards Radnor Forest, but also extensively east towards Presteigne. Significantly, one can also see for long distances south along the line of Offa’s Dyke to Rushock Hill and Herrock Hill and Hergest Ridge beyond. 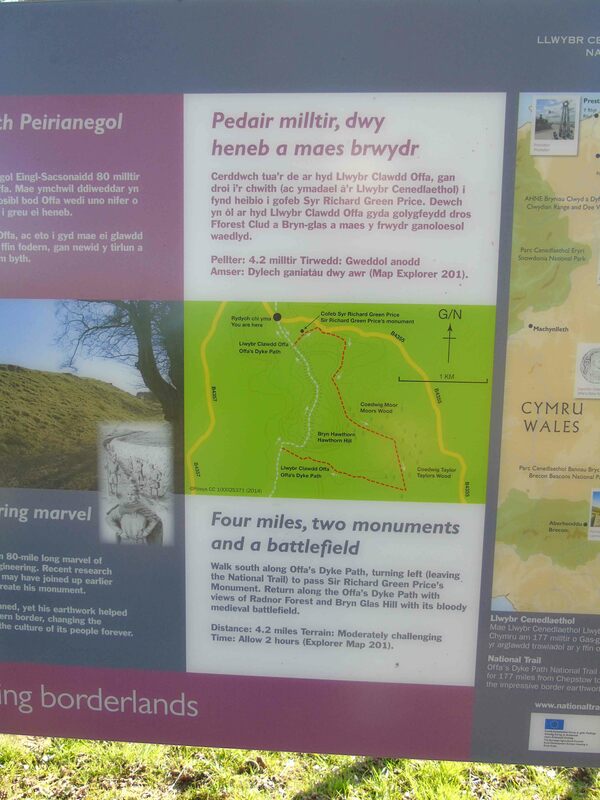 In this regards, the hill possesses many of the features I discussed for the Offa’s Dyke monument’s immediate environs at Bronygarth south of Chirk. The hilltop must surely must be a contender for a beacon and/or lookout point relating to Offa’s Dyke since from here one can see multiple points along the dyke north and south, but also far behind the dyke to forewarn of any infringements of its line. What about modern memorialisation? 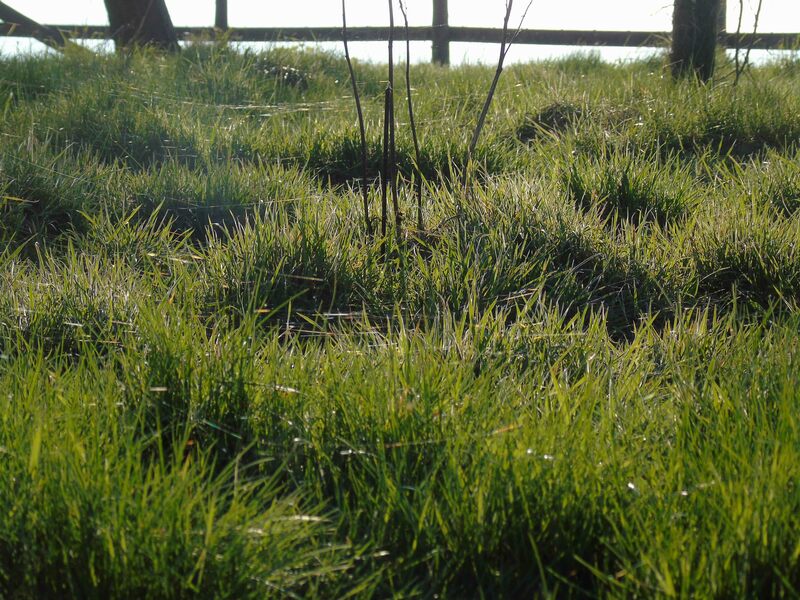 In the low evening sunlight, spider’s webs spun between blades of grass were visible, and there were discrete bunches of daffodils. There were a few pine trees, affording the hilltop a distinctive landmark from all directions. At the very top of the hill there is a solitary picnic bench. It was here that I noticed a modest memorial dimension is manifest in a solitary poppy appended to the bench. 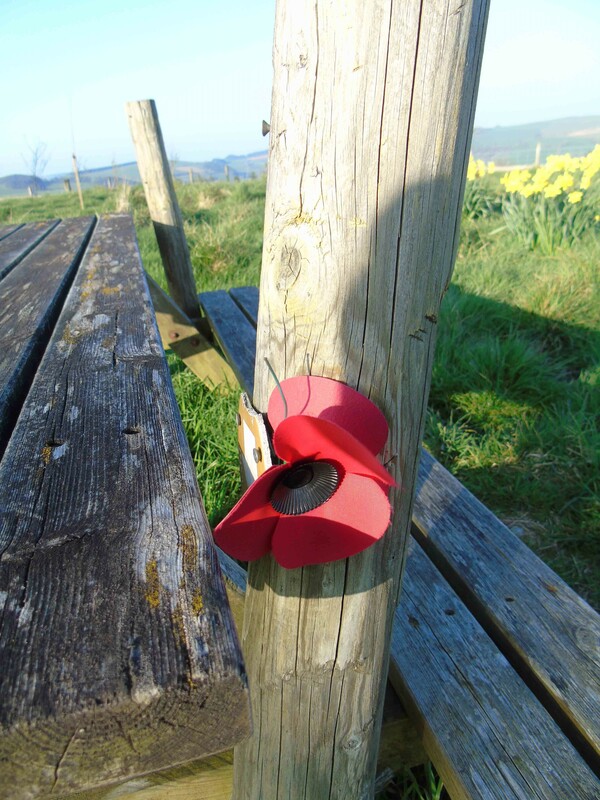 Undoubtedly this is a popular place for walkers and perhaps also for ash-scattering and memorialisation… For whom was the poppy placed? Following our inaugural workshop at Shrewsbury in April 2017, a number of the attendees contacted the ODC to sign up as members. In addition, we’ve just had our first set of new members who were not at the Shrewsbury workshop. Dr Eleanor Rye, University of Nottingham. If you have expertise in early medieval history, archaeology, place-name research, or another related dimension of the study of early medieval frontiers, please consider joining as a member of the ODC.